The Application Summary tab provides you with a high-level overview of your entire application using the Six R's (Receive, Resolve, Respond, Research, Report, and Route). The Rule Types tab uses a heatmap to show details about all of the rules in the application. The Rule References tab uses a heatmap to show all referenced rules in the application. To access the Application Visualization Display, click the application name located in the upper left-hand corner of the Developer portal. Built on Application — Shows the application rule name for the application. Clicking on the application name opens the rule form. 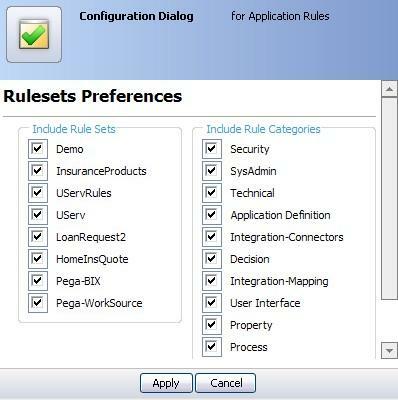 RuleSets — Displays the total number of application RuleSets. Clicking on the number displays a list view showing every RuleSet belonging to the application. Rules — Clicking on the number next to Rules displays a list view showing every rule in the application. Last Updated — Displays the last time that the application was updated. Users — Displays the total number of Operator IDs that have access to the application. Clicking on the number displays a list view showing every Operator IDs that has access to the application. Classes — Clicking on the number next to Classes displays a list view showing every class found in the application. 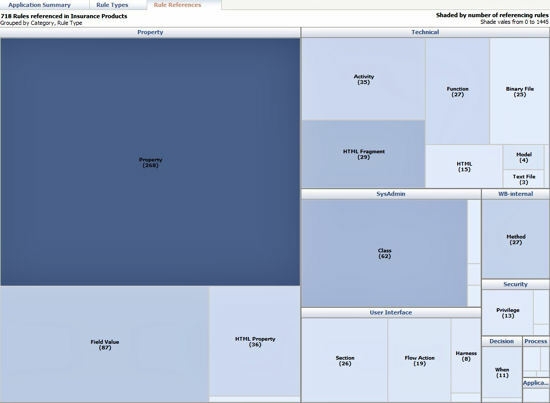 Properties — Displays the total number of properties used in the application. Clicking on the number displays a list view showing every property found in the application. Use Cases — Displays the total number of use cases in the application. Clicking on the number displays a list view showing every use case in the application. Critical — Clicking on the number next to Critical displays a list view showing every critical warning found in the application. Non-Critical Warnings — Displays the total number of non-critical warnings found in the application. Clicking on the number displays a list view showing every non-critical warning found in the application. 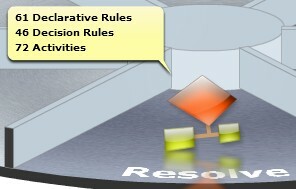 The bottom half of the Application Summary tab organizes the application into a rotating graphical display utilizing the Six R's (Receive, Resolve, Respond, Research, Report, and Route). For each of the Six R's there is a callout detailing the the rule categories associated with it and how many of each rule type is in that category. Clicking on a rule category in the callout displays a summary view listing every rule type in that category. Expanding a rule type shows all instances of that rule type. 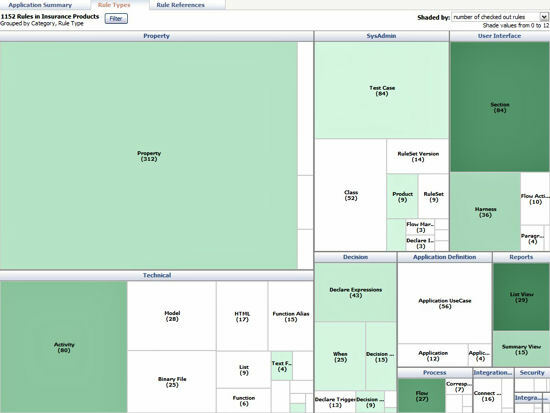 The Rule Types tab displays a heatmap showing all rules found in the application, grouped by rule category and rule type. Left-clicking on a rule category displays a summary view listing every rule type in that category. By expanding a rule type, you can view all instances of that rule type. Right-clicking on a rule category displays a list view based on how the heatmap is shaded. For example, If the heatmap is shaded according to the number of checked out rules, all rules in that rule category that have been checked out display. You can add or remove rule categories and RuleSets in the heatmap by clicking Filter. This causes the Configuration Dialog popup to display. Check or uncheck the RuleSets or rule categories you want to add or remove in the heatmap. Click Apply to save your changes. The Rules References tab consists of a heatmap showing all referenced rules in the application, grouped by rule category and rule type. Left-clicking on a rule category displays a summary view report listing every rule type in that category. By expanding a rule type, you can view all instances of that rule. Right-clicking on rule category opens a SmartInfo popup window displaying all rules that are referenced in the application and the number of times they are referenced. Clicking on a rule displays the Referencing Rules window.